Yes, it is Not So Wordy Wednesday and those are indeed words, lots of words, you see as you scroll down this page. But they're not my words... I'll keep my words to a minimum as usual on Wednesdays and let Mary Kassian take the floor. What she has to say in this post (copied with permission) is profound and well in keeping with the purpose of this blog. But before I give Mary the floor, I do want to remind you that it's not too late to get in on my 100th blog post give-away that started on Tuesday and ends next Monday, April 12th. So click here to see yesterday's post and enter quickly! And don't forget! Comments on today's post will be entered into the 100th Post give-away contest too. So up your chances by commenting here on Mary's post. I've also provided a link to her blog site so you can communicate with her if you'd like. It's one of my favorites! The commercial anticipated that men would identify with the cultural de-masculinization of males depicted by the pant-less parade. The take-away was that they would be challenged to once again “Wear the Pants,” both literally and figuratively. Once upon a time, men wore the pants, and wore them well. Women rarely had to open doors and little old ladies never crossed the street alone. Men took charge because that’s what they did. But somewhere along the way, the world decided it no longer needed men. Disco by disco, latte by foamy non-fat latte, men were stripped of their Khakis and left stranded on the road between boyhood and androgyny. But today, there are questions our genderless society has no answers for. The world sits idly by as cities crumble, children misbehave and those little old ladies remain on one side of the street. For the first time since bad guys, WE NEED HEROES. We need grown-ups. We need men to put down the plastic fork, step away from the salad bar and untie the world from the tracks of complacency. It’s Time to get your hands dirty. It’s time to answer the call of manhood. 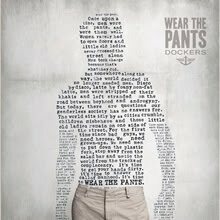 IT’S TIME TO WEAR THE PANTS! The Docker’s ad campaign reveals that there’s an underlying sentiment amongst men that their masculinity has been devalued. They have been feminized – “left stranded on the road between boyhood and androgyny.” The new cultural definition of manhood does not “fit” with who they are, and they are keenly feeling the disconnect. Men are not women. They are not genderless. They are not androgynous. They have an innate, God-given bent to initiate and be heroes. They want to untie the world from the tracks of complacency. They want to get their hands dirty. They want to answer the call of manhood. They want to be MEN… and what’s more, they want women to be women. Though Dockers doesn’t provide a satisfactory resolution for the gender conundrum, it does raise a profound point: There IS a strong connection between gender and and the “answer” to the world’s problems.Gender is not the answer. But it was meant to point to and reveal the answer. Manhood and womanhood were created to display the story of the Gospel and the glory of God. So when we don’t get gender right, the answer to humanity’s problem is obscured. I agree that it ’s time for men to wear the pants. But I’m not talking about the khakis that Dockers are peddling, or some re-invented macho-male cultural stereotype. It’s time for men to wear the pants of godly manhood, and women to wear the skirt of godly womanhood, so that the gospel of Jesus Christ will be proclaimed …And so that this genderless generation, which is so broken and desperately seeking for answers, will find THE answer to the deepest question of the human heart.